Forget traditional roast, here is another alternative for your Sunday lunch,- Roasted Rosemary Chicken with Walnuts, Grapes and Rice. The flavours are rather subtle but yet sophisticated and very comforting at the same time. 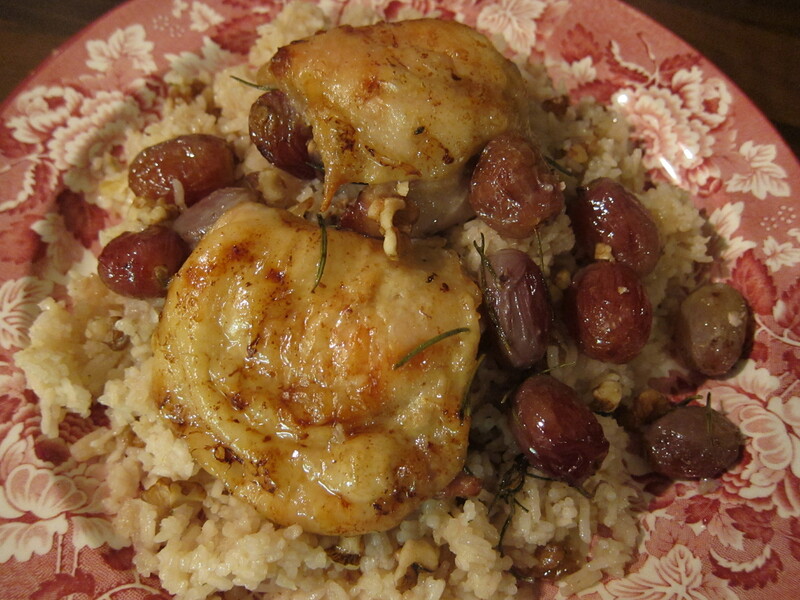 Grapes and nuts – couldn’t be better match, only if you add chicken and rice to it! Original recipe came from a site called Good Eggs and asked for brown rice, however, I didn’t have it, used basmati one instead, the result was just as good, plenty of walnuts adds enough nutty flavour to the dish. Highly recommend for dinner parties, as it is incredibly easy to prepare and perfect to please almost everyone (except those with the nut allergies). Preheat oven to 220C, with a big cast iron skillet inside. Salt and pepper the chicken. When the oven is hot, remove the skillet and add a glug of olive oil to it. Then add the grapes and chicken – taking care to not crowd the pan too much with ingredients. Give the pan a little shake to distribute the olive oil on the grapes, tuck a few sprigs of rosemary between the grapes and chicken and place skillet inside the oven. While the chicken cooks, make a batch of rice, according the package instruction, depends on which rice you choose to cook. After about 35-40 minutes, the chicken should be done – check to see if the juices run clear and the flesh is white but still juicy. Remove chicken and grapes from the pan with tongs or a slotted spoon, taking pains to leave the drippings in the skillet. Dress the rice with a few table spoons of the chicken drippings, along with a handful of coarsely chopped walnuts and the grapes. After the chicken has rested for a few minutes, plate together and serve!